Ping pong balls. What does that remind you of? The racquet sports class you took as your gym requirement in high school? Rowdy parties in college? Forrest Gump? Would you believe there was anything cool that could come from ping pong? (Sorry table tennis players, your sport will never be cool.) Prepare to be surprised! 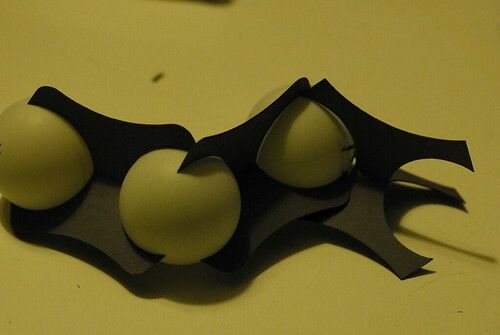 I met someone at Metrix who was working on a class assignment for making interesting packaging for ping pong balls. Dave Opincarne wasn’t just trying for status quo either; he was looking for the bonus prize by making his packaging have a value-added component. It ended up being really neat and fun to play with! Dave is a first year design student at the UW and is currently taking a class called 3D Fundamentals, an industrial design class. The assignment was to make ping pong packaging out of poster board. 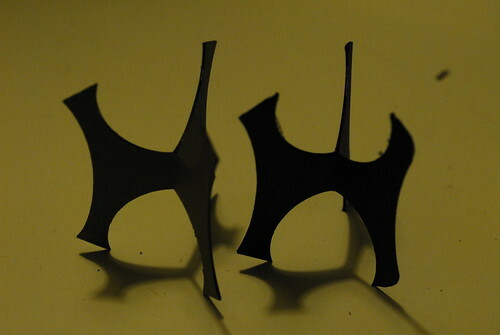 There were many requirements for what the packaging had to be like, including: capable of hanging, functional, effective, being able to display content, feasible for mass production, minimal number of parts, aesthetics, along with a couple of others. Honestly I was a little surprised with the number of demands for a first year class, but it seems like good preparation for the real world. Like I mentioned, he also decided to take on the bonus challenge of making it have a value-added element. Rather than end up in a landfill, the packaging would be a feature. What he came up with was a simple way of attaching the balls together, allowing people to create interesting sculptures with just ping pong balls and paper! He began with an initial exploration of how it was possible to hold a ball with paper, cutting his prototypes out of notecards. It took several iterations, but eventually he came up with his interlocking system. He had been working on his design for a couple of weeks with the rest of his class when the due date for the assignment was suddenly bumped up. While everyone else scrambled to painstakingly cut their designs with X-ACTO knives, Dave had something special up his sleeve. The laser cutter at Metrix of course! 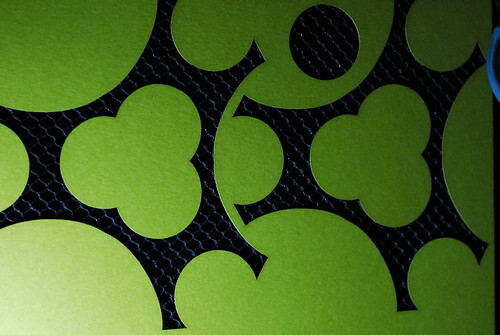 The laser cutter can cut paper very quickly, and is so exact it looks like a professional job. As a man who commutes from Olympia (wow), time is definitely precious for him. Thanks to Metrix, he was able to finish his assignment early. Another thing I found interesting about Dave was his philosophy about why he was getting into the field of interaction design. I had never heard of interaction design before, but was informed that it focused on the synergy between people and technology, rather than just creating the technology itself. He compared it to an architect designing a building with the occupants in mind rather than a structural designer making sure the building didn’t fall over. It reminded me a lot of how Metrix is all about the experience. You can learn, and explore and push boundaries instead of just consuming. I would love to see a future where more packaging was usable, or made out of a recyclable material. You know how little kids love to play with the boxes that toys come in, rather than just the toys themselves? Ideas like Dave’s are that, but for adults. This is such a simple concept that I think could really make a big impact on waste. This project really goes to show that there are alternatives to throwing things away, and I think designers will be rewarded for their extra effort. I’ve written before about someone using Metrix to excel in school, and I’m glad to see that trend hasn’t died. I’m sure Dave with be successful in his future career, and am happy that Metrix was there to bolster his creativity.